After the excitement of last week’s live episode, Simprovised, the 27th season of The Simpsons comes to an end, when this Sunday, May 22nd, 2016, Fox aired “Orange Is the New Yellow”, the 22nd episode of Season 27, the 596th episode to date and the Season 27 finale. This Episode Fact File will recap the episode with pictures, video clips and more. Get the scoop right after the jump! 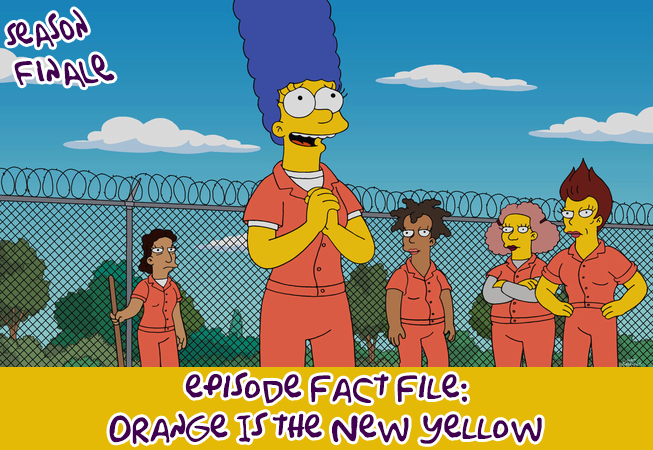 Episode Details: ‘Orange Is the New Yellow’ is the 22nd episode of Season 27 as well as the 596th episode of The Simpsons, and is the Season finale. The episode aired on FOX on May 22nd, 2016 and was written by Eric Horsted and directed by Matthew Faughnan. Homer was leaving the Power Plant on Thursday and recieved a phone call from Marge, promising her to come home for dinner, however he’s stopped by Mr. Burns asking him to fix a gas leak by covering it up with a “safety first” poster. However, Homer gets delayed by Mr. Burns requiring its level to be measured with a plumb bob (procedure that takes three hours to complete). At home, Marge has trouble with the kids, and when Lisa asks for her help dressing her as a male seahorse while feeding Maggie, Maggie spills her food all over. Bart offers to clean up, but combines chemical products creating a hole in the floor. Marge sends him to play outside while she cleans the mess, and Bart goes to Springfield Park, where Martha Prince sees he’s unattended and calls the police. Taking Bart back home, Wiggum arrest Marge for leaving him alone outside. At the trial, after trying to convince the judge, with the result of her mother being arrested too, Marge is sentenced to ninety days at the Springfield Women’s Prison. In jail she realizes that she can have time for herself away from the chaotic home. Meanwhile, Homer is helped by Ned Flanders and the other neighbours to deal with being alone dealing with the kids. In the prison, Marge fits in well, uses her hair to fight against bullies and attends flowers in the garden, and being happy there, she refuses to be set free when the Blue-Haired Lawyer finds a loophole to get her out and fires a guard’s gun and gets two more months in jail. Parents become overprotective over their kids after what happened to Marge and starts walking them on a leash, with Homer as a sitter. Having had enough of their attitude, the kids decide to break from Homer‘s care and go to the park, where they end up finding themself in trouble when a tornado forms. Back at the prison, Marge sets the other on prison break by mistake, and in the middle of the chaos, Homer, undercover as a prison guard, helps her escape to safety, her hair ricocheting a warning shot from a guard to stop her from breaking. Back home, Marge can’t get away from Bart and Lisa becoming overly attached to her and the whole family ends up hugging inside the closet. TITLE SCREEN! : Cupid flies over the screen with a banner that says “Season Finale”. A dragon appears and burns him and the banner. Homer crashes in the door with a Couch building manual. The manual opens and Marge asks Homer to build the couch. Homer calls Shøp to get the materials and asks Bart to build it for 1$ but Bart refuses. Homer throws the manual in the trash bin and collects all he needs: instruments, 3 cans of Duff beer, 3 donuts and 5 hours of time. Homer starts building it, not without accidents, and 10 hours later, Marge enters the room to find him having made no real progress and demands Homer to do something. Homer proceeds to collect a rock to break Flanders‘s window, steal his couch and bring it home, much to Ned‘s rage. The episode title is a reference to the television series Orange Is the New Black. The show was previously referenced in the comic story Yellow Is the New Black. Wiggum makes a pun on Silvester Stallone‘s name, Silvester Alone. Marge reads a book by James Patterson. The title of the book, Bishop takes night, is a reference to bishop takes knight in chess. The black and white scenes with Homer as homemaker are a reference to Donna Reed. The couch gag is inspired by the style of IKEA‘s manuals. In the credits, Couch is stylized to Cöuch, while in the couch gag it’s spelled as Coüch, a reference to IKEA‘s Swedish nationality. The music in the couch gag is “Computer in Love” by Perrey and Kingsley. Lenny shouts “Oh not again” when falling from the ladder in the Power Plant. In the store, Maggie‘s price is “Read Again”. The bear in Mr. Burns‘s office is shown to be a real bear. Before the couch gag, Homer is already holding the manual when he gets run over by Marge and Maggie in the Orange Station Wagon. At first, Marge needed a phone to hear Homer through the bulletproof glass in the Prison‘s visiting room, but later, Homer is able to talk to her without the phone. When Marge fires the prison guard’s gun, the guard has long sleeves. However, the sleeves become short once Marge is handcuffed. When Marge is escorted out of the visiting room, the guard’s sleeves are long again. See you soon with more informations on all the Season 28 episodes and more in the links just below. 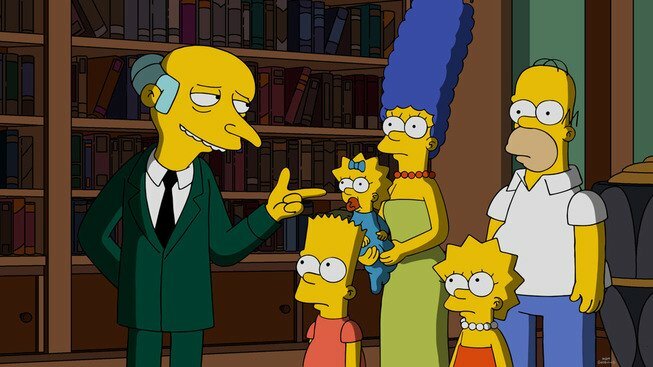 Thanks for tuning in every time a new episode popped up and we’ll see you all September 25th for Season 28, starting with Monty Burns’ Fleeing Circus! 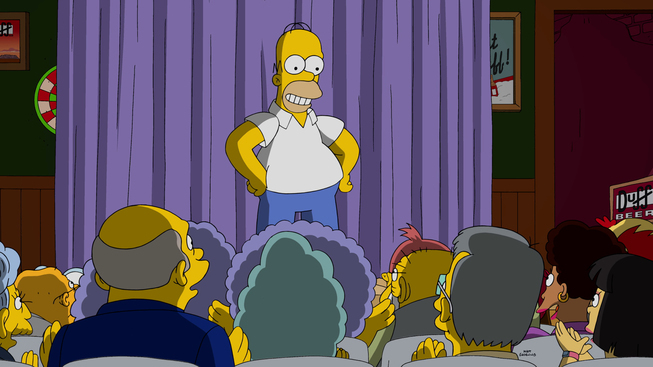 This pictures and videos are from the “Orange Is the New Yellow” episode of FOX show The Simpsons. Their use is believed to qualify as fair use under United States copyright law.